This is the free version of MH Purity WordPress Theme with basic functionality. The theme can be used to create fancy and stylish online magazines, news websites or modern blogs. In case you need more professional features and options, you can upgrade to the premium version and benefit from great features and excellent theme support. 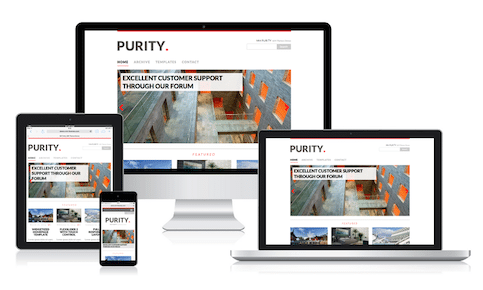 MH Purity lite is a fully responsive and free magazine WordPress theme that looks great on desktops and mobiles devices. The theme includes basic versions of our popular widgets “MH Custom Posts” and “MH Slider”. Feel free to upgrade for more. We have added built-in styles for the popular Contact Form 7 plugin, which lets you create a working contact form. MH Purity lite is translation ready and supports also languages written in a Right-To-Left direction (RTL Support). WordPress 4.7+ ready, supports all modern browsers (IE8+, Firefox, Chrome, Safari, Opera) and WordPress Multisite. MH Purity lite is distributed under the terms of the GNU GPL. You may customize the theme in every way you want. You can install MH Purity lite WordPress theme through your WordPress dashboard, like you would do with any other WordPress theme. In case you are new to WordPress, you can find more instructions on how to install WordPress themes in this tutorial: Using Themes in WordPress. The theme options panel to customize your WordPress theme (e.g. upload a logo, change background, etc.) is located in your WordPress dashboard under “Appearance => Customize”. In addition, you can find a lot of helpful information and tutorials in our Support Center. To display thumbnails for the several custom widgets and archives on your website, you’ll need to upload featured images to your posts. In case you don’t have uploaded featured images yet, you might see blank image placeholders instead of thumbnails. You can read and follow this tutorial to learn more about featured images in WordPress: How to use featured images in WordPress. When you have activated MH Purity lite WordPress Theme for the first time, the theme will display your articles in default blog style. To display the content on your front page in magazine style, you’ll need to create a static front page first and assign the built-in “Homepage” template to your static front page. For more information, please have a look at this tutorial: How to set a Static Front Page in WordPress. After you have set a static front page for your website and have assigned the “Homepage” template to your static front page, you can navigate to “Appearance => Widgets” in your WordPress dashboard and place widgets like “MH Slider” and “MH Custom Posts” in the widget locations “Home 1” and “Home 2” (see screenshot). In case you need more help on how to use widgets, please read this tutorial: WordPress Widgets.